AvmGames Escape Fantasy Ice Cream Land info about the game-Games2Rule. You actually got through a magical portal and ended up in a fantasy world, an ice cream land. Now this is unbelievable, it's so beautiful here that you would never leave. But after tasting every flavor of ice cream, you really want to get back home. 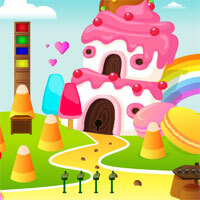 In this game, you will need to explore the ice cream land to find a way to escape. Look for hidden objects which can turn out to be useful and use them to solve puzzles and escape.